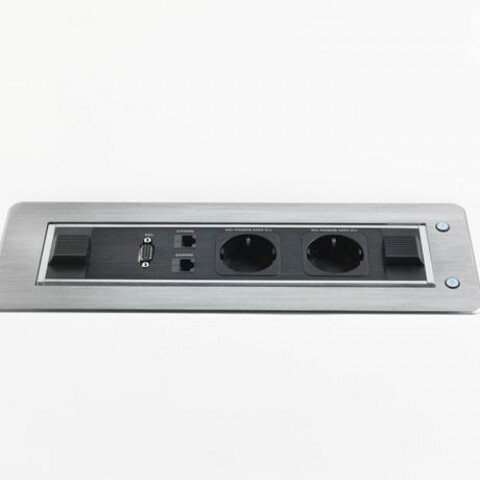 A motorised Control Panel that rotates to offer a blank plate, or a dedicated control panel, featuring options of Power, VGA, Cat 6 Data, HDMI & 5v Charging USB in a mix of configurations. A discreet led button activates the rotating barrel and all units come supplied with 2 Metre Long Cables and in choice of finishes. Different configurations are available as a special order, subject to certain minimum order quantities. IMPORTANT NOTE : This is a 'clearance line' because the unit has ceased being in production at the factory hence the extra discount and has been replaced by a new model (see cross selling options at bottom of page). So please be wary of this before cutting holes, as once the stock has gone - we won't be able to supply any more!